A new report [PDF] from New York State Comptroller Thomas DiNapoli says that the MTA budget picture is slowly improving as tax collections and ridership increase with a recovering economy, but that won’t protect straphangers from big fare hikes. Revenues from the Payroll Mobility Tax and the more volatile tax on real estate transactions are expected to increase, driven by employment gains and the commercial real estate market. But the MTA’s operating budget — currently $12.5 billion annually — will face widening gaps because of ever-increasing debt and labor costs, growing from $487 million in 2013 to $1.44 billion in 2016 – a total shortfall of $3.76 billion over the next four years. The increase in labor costs is especially pronounced when it comes to health insurance and pensions. Governor Cuomo and the state legislature have not stepped up with new funding, so the MTA has its own plan to cover nine of every 10 dollars in the budget gap. Toll and fare increases will pay for 82 percent of the shortfall. Fares are expected to increase every other year, rising 35 percent between 2007 and 2015 – almost three times faster than inflation. 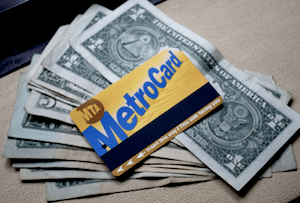 Why will each MetroCard swipe cost more? Let’s take a look at the debt and labor costs creating the gaping maw that straphangers will soon be asked to fill. Debt service passed $1 billion annually in 2005, is expected to pass $2 billion in 2012, and is forecast to pass $3 billion in 2016. By 2018, debt service is expected to consume 20 percent of the MTA’s revenue. The 2015-2019 Capital Program, which could include future phases of the Second Avenue Subway, is not yet funded. If borrowing continues to be the major payment method, annual debt service could reach $4.4 billion by 2024. Labor costs make up 60 percent of the MTA’s annual budget, and costs are expected to grow in the coming years. The MTA has already frozen non-union wages for three years, and is budgeting the same freeze for union employees, despite not having an agreement with the Transport Workers Union. Health insurance and other employee benefits are expected to grow 42 percent by 2016, when they will cost $1.2 billion per year. Pension contributions by the MTA have risen to cover investment shortfalls and are budgeted to rise to almost $1.5 billion in 2016. In addition, the MTA is on the hook for $17.8 billion in future non-pension post-employment expenses, such as health care and life insurance. Overtime costs are expected to slowly decrease in the coming years from an all-time high of $664 million in 2009, although reliance on overtime to cover staff shortages has already led the MTA to increase its year-end 2012 estimates. Despite the planned fare hikes, transit ridership is expected to recover its pre-recession highs, outpacing growth in bridge and tunnel traffic, which is expected to remain below its 2007 peak. Metro-North ridership is expected to grow the most of all MTA services, reaching a new all-time high this year. Access-a-Ride costs will grow 43 percent to $549 million in 2016, even as the MTA tightens eligibility standards and sends more users to taxis, subways and buses. Even though bus ridership has reached its lowest level since 1999, the MTA forecasts more bus riders in coming years. This seems dubious in light of the MTA’s most recent customer satisfaction survey, which found that 13 percent of subway riders have switched regular trips from the local bus to the subway, with half citing slow bus service as the reason for the change.